There's been a lot going on at TEEX's Disaster City®. The Aggie-led 84th Weapons of Mass Destruction Civil Support Team (WMD-CST) from Casper, Wyoming, finished a week of training, simulations and drills. 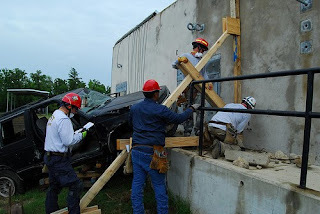 At the same time, a Structural Collapse Technician II class of 18 completed completed two weeks of training. We all remember the horrible earthquake in Haiti. Texas Task Force 1 (TX-TF1), of which I'm the public information officer, was activated and prepared to deploy to the island. As teams arrived in Haiti and the situation was assessed, limited runway, port and logistics concerns caused Texas Task Force 1 as well as several other teams to stand down. One can't help but be disappointed when this happens. We were "all dressed up with no place to go" so to speak. However, the system is understood, and it works. We'll treat it as an exercise and learn what we can. 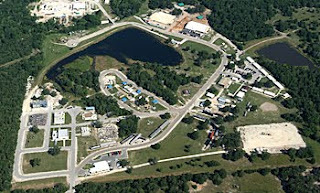 TX-TF1 trains well here at our 52-acre Disaster City® Campus, but there is no substitute for what we learn when we employ our training in a real situation. Disaster City® has excellent props and the finest, most experienced instructors in the world, but the men and women who did deploy to Haiti came back with real knowledge and stories that TEEX instructors and clients need to hear. Luckily, we have several good friends on the teams that did deploy. Of the 28 FEMA task forces scattered throughout the United States and it's territories, many have trained with TEEX. Phone calls were made and offers extended. After returning to the mainland and spending a few days with family, three members of New York Task Force 1 (NY-TF1) boarded an airplane for Texas A&M's Easterwood Airport for five days of debriefing at Disaster City®. New York City Police Detectives Phil Pietrunti and Soeren Lygum, along with Randy Miller, deployed to Haiti as members of the New York Task Force 1 Urban Search and Rescue team on Jan. 16, 2010, where they made six rescues. Both Pietrunti and Lygum said the event that stands out the most is the rescue of two children, ages 8 and 12, who were buried in the rubble of their two-story home. When the team arrived at the collapsed building, the children's father had been trying to dig them out with a crowbar for eight days. Brian Freeman, who coordinated their trip to College Station, was determined to get as much information and exposure out of them as possible during their 5-day stay. So, they started by having Phil & Soeren speak directly to the two groups going through training at Disaster City®. Both groups appreciated the frank description of their experiences and what did and didn't work. A database is essential in tracking people and equipment. We had the only forklift at the airport for quite a while. We had to learn how to balance the resources available to us. Remaining self-sufficient was always on our minds. We brought enough food and water for 72 hours, none for showers. Civilians were essential allies as translators and communicators, telling us where people were buried. Hand-held GPS's work much better with maps. Our techy communications officer improvised to get us what we needed. Essential (techy communications officer). If buildings are built to U.S. Code, they are less likely to fall down. 1kw generators are too small. The toll on civilians was horrendous, many begging us to dig out the bodies of dead family members. The information exchanged in the focus group was invaluable and sobering. According to Pietrunti, after an experience like Haiti, "You don't sweat the small stuff. You realize how lucky and blessed you are." On Saturday night, we were proud to introduce Detectives Pietrunti and Lygum at the Baylor vs. Texas A&M's Women's Basketball game. Women's basketball is a favorite winter passion here in the Brazos Valley, and Reed Arena was packed. The detectives seemed humbled by the attention, but I know they appreciated the support. We were fortunate to host Randy, Phil & Soeren and deeply appreciate the time they took away from their jobs and family to share their experiences from Haiti. They voiced their appreciation for the opportunity to share, and felt honored that TEEX called and gave them a chance to pass on what they learned to everyone in the rescue community. Just another week in Disaster City®. Brian Smith is the public information officer for Texas Task Force 1.